I take pride in writing to you, more so after being recently declared as the National Heritage Animal of India by the respected Union Ministry of Environment and Forests. I write to you with regard to the damage done to my image by your Ministry. I am blind but I did not expect the Ministry to be so blind that it would not be able to distinguish between me and my African cousin. A truck hit me last week as I walked the streets of Delhi, but I am more hurt by the act of negligence of publishing images of African elephants on stamps released by the Tourism Ministry of the Government of “India” to mark World Tourism Day. African elephant, really??? For ages I have lived on this land and have played a key role in the development work of the nation, especially in rural and inaccessible parts of the country. I agree I had no reflector on me courtesy my owner, which made me a soft target for drivers in the city at night. But on that unfortunate night when I was hit by a truck, I was harnessing a pain and sorrow even before the road accident happened. The news of seven of my friends being mowed down mercilessly by a freight train in West Bengal had come piercing to my heart. And even before I could come to term with their deaths, I was hit by the truck as if I was punished for being sentimental and showing concern for my fellow being. If I didn’t show concern who else would have? Our Green Hero, Mr. Jairam Ramesh will soon be visiting the site where my friends were killed in Jalpaiguri, and work out a way with the Railway Ministry to prevent such unwanted deaths in future. Major concerns over corridors have now come up and according to Railway Officials, they had no prior information from forest officials about elephant movement in the accident area, which according to them is a ‘denotified’ area. Or else they would have driven slowly and blown the whistle constantly to warn the animals. I will like to bring to your notice that it’s the same issue: of not being able to identify correctly. First to identify the elephant corridors and now to identify me, the Indian elephant who has served the nation since time immemorial from my distant cousin the African elephant. I request you to kindly take the step of restoring my pride as seriously as the steps taken by Mr. Ramesh in restoring the elephant corridors. It will not be a good thing if my distant cousins in Africa hears of such news as it will then be a mockery of my image. I would never again be able to serve the nation with the same pride. I am blind but I can see the pain and misery of my fellow elephants. I pray to all those in power who are not to act wisely and not ignore our plight as if nothings wrong. 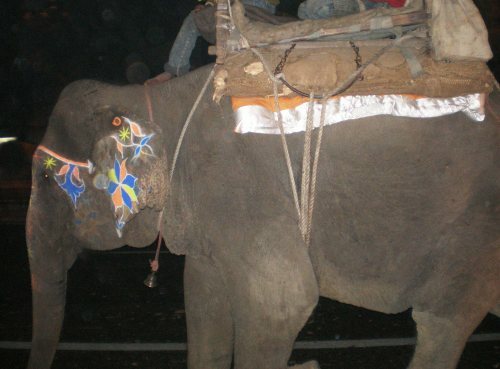 Editor’s Note: Bhola is an Indian elephant who has been working in the streets of Delhi for quite some time now, first to move things, now after turning blind, as a showpiece animal. You may have seen him on the streets sometime or the other. NextOctober 15th 2010: Global Blog Action Day on Water! Good effort Impuri to let us all know about Bhola and negligence of all his brothers,sisters on a larger front. Thanks Bhavesh…it is, but just a small step towards conservation and protection of our national heritage animal and share its plight with a wider audience.